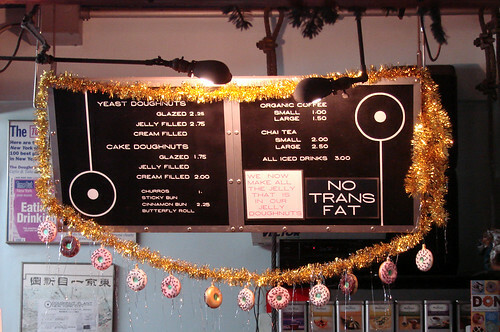 The Doughnut Plant at 4:03pm on New Years Eve is a hopping place. The was about eight people deep and they were low on doughnuts. Every once in awhile we'd hear the nice man behind the counter say "sorry, we're all out." By the time we got to the front of the line they were out of the Tres Leches and my old standby the Valrhona Chocolate Doughnut. Oh noes! I ordered the last Pomegranate Yeast Doughnut, two Cinnamon buns (one for Lawman and one for Blondie) and a Gingerbread Doughnut. Blondie and I retired to the bench in the back of the shop where we stumbled on a fellow food pornographer standing on the bench getting his shots of the brightly colored doughnut motif. I suspect Ms. Blondie was relieved that I wasn't standing on the furniture to take my photos--this time. The gingerbread doughnut was nothing short of amazing. Melt in your mouth good and perfectly spiced to boot. 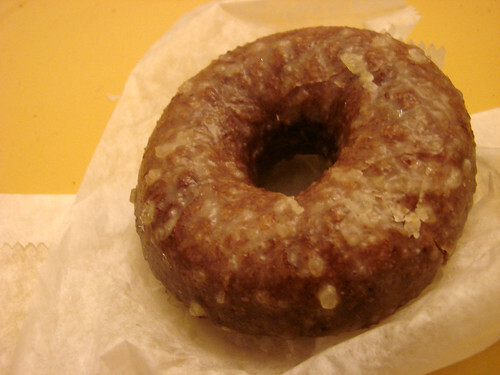 This is a doughnut that you want with a cup of coffee on a cold winter's morning. 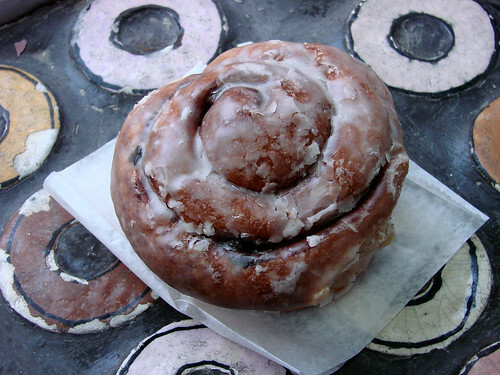 This is a doughnut that I want right NOW. No seriously, I'm plotting when I can get another one of these. We have conflicting reports of the cinnamon bun. Lawman at his heated up a few hours after purchase for dessert on New Years Eve and really enjoyed it. He especially liked the very plump raisins that we scattered throughout. Blondie ate hers the next morning and said that it didn't hold up as well overnight. Her's was the very last cinnamon bun and it had been on the display plate at the front of the store, so it's possible that she got one of the very first cinnamon buns of the day so by the time she ate it the bun was past it's prime. In any case, I can definitely recommend them fresh. But really, why would you get a Cinnamon Bun, or a Pomegranate Doughtnut for that matter, when you can get a Gingerbread Doughnut? 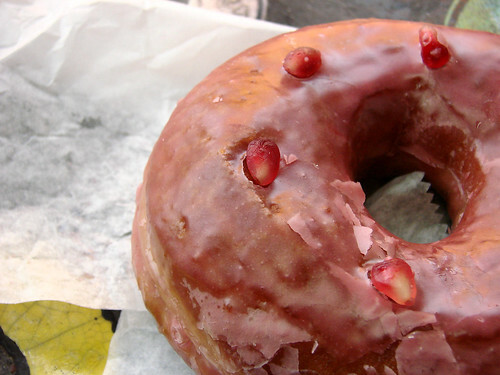 Stop reading this and head over to the Doughnut Plant! Hey reading your blog makes me so home sick for New York! The gingerbread ones are the best, I used to wish that they did them all year round! Have they changed that yet? why does gingerbread only get eaten at Christmas???? The pomegranate one is very pretty! I absolutely love the Doughnut Plant! When I came to NY to visit my friend Jenny, it was one of the stops on her bday food tour (http://thisfoodismyjam.blogspot.com/2008/09/birthday-food-tour-in-nyc.html). Can I Get Some Dan Dan? Kong Hei Fat Choi! Macaroni and Cheese Dumplings! File Under "You Need This in Your Life....NOW"
New York Restaurant Week: Yea or Nay? New Truffle from Kee's Chocolate! Owls + Hot Pants = Hooters!! Sullivan Street Treats at 'wichcraft! Let Them Eat Van Leeuwen Ice Cream!